This handle is used for parallel welding. This tool was designed for quick assembly of accumulator packs. The Shunter may also be used for welds where the ground connection cannot be made opposite the welding site. The trigger force can be adjusted on each arm of the Shunter to ensure equal welding quality at the two sites. 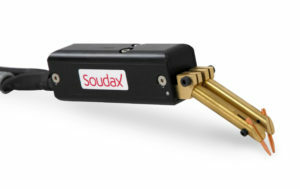 Handle equipped with two independent arms, with trigger pressure adjustable via a tared spring on each arm. Electrode spacing adjustable simply by rotating the arms. Extended use of this tool may result in operator fatigue.